This chapter contains a tutorial that illustrates some basic features of Studio. 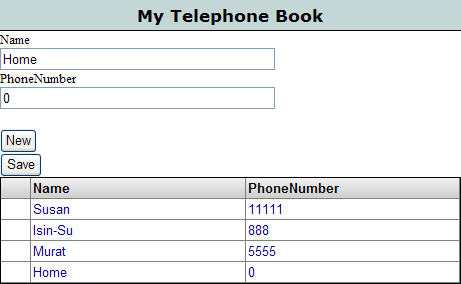 The tutorial shows you how to create a database application that is a phone book, containing names and phone numbers. A database in which you can store names and phone numbers. An interactive user interface on a Web page (an HTML form) that allows you to add new entries, search for entries, and edit entries in the phone book. Create a Caché Project to manage the source code for the application. Define the application's database using a persistent database class. Create a Web-based (HTML) user interface for the application using Caché Server Pages (CSP). 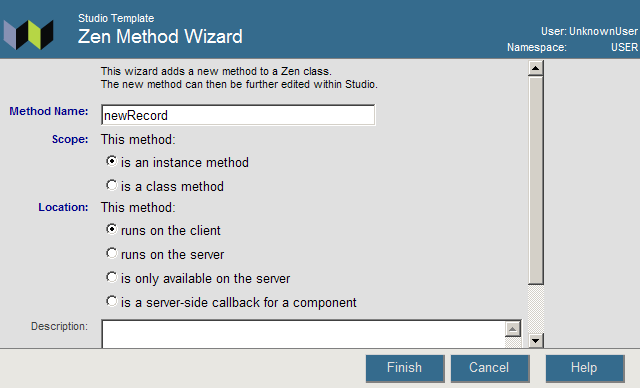 Create a Web-based (HTML) user interface for the application using InterSystems Zen. Start Studio; right-click the Caché cube and select Studio. Studio connects to the local Caché server using the namespace used most recently by Studio (or displays the namespace dialog if this is the first time Studio is connecting). If Studio is not connected to the namespace in which you want to work, connect to a different namespace using the File > Change Namespace. By default, Studio displays the Workspace window and creates a new project called Default_system. The Studio Workspace window indicates the name of the current project as well as the server connection and namespace name. The Workspace window should be displayed by default; if you don't see it, display it using the View > Workspace or with the Alt-3 keyboard accelerator. To save your new project, select File > Save Project As and enter Phone Book. You can save this project to the Caché server at any time using the File > Save Project. The Phone Book application is a database containing people's names and phone numbers, stored using a set of persistent objects. These objects are defined by a persistent class called Person. For sake of organization you can place this class in a package called PhoneBook. The persistent class Person contains two properties (or fields): Name and PhoneNumber. Start the New Class wizard by selecting File > New > General tab. On the first page of the New Class wizard, enter a package name, PhoneBook and a class name, Person. Select Next. 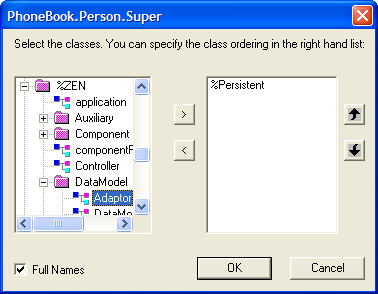 Select Persistent from the list of available class types. Select Finish. Select Class > Add > Property to start the New Property wizard. Enter a name for the new property, Name, andselect Finish. Select Class > Add > Property. Enter PhoneNumber. Select Finish. You could have also added the PhoneNumber property by copying, pasting, and modifying the Name property directly into the Class Editor window. Items are indented to structure the code to improve readability. A plus/minus expansion box is provided to the left of each item so that you can collapse sections of the code that you are not currently looking at. Save this class definition to the database and compile it into executable code with Build > Compile or select the Compile icon . You now have a PhoneBook.Person class defined in your database. In the Inspector, double-click the keyword Description. Select OK when you are finished. Save your class and view the documentation again. The user interface of the Phone Book application is a Web page containing an HTML form that lets you edit and view data, name and number, for a person in the database. You create this Web page using a CSP file that contains a form bound to the persistent PhoneBook.Person class. 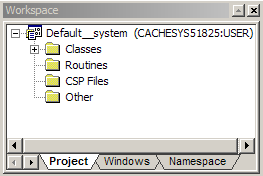 Create a new CSP file by selecting File > New > CSP File tab > Caché Server Page. A CSP Editor window is displayed containing source for the new CSP page entitled Unititled.csp. In the Save As dialog, double-click /csp/user to open this directory. Enter Person.csp. Select Save As. In the editor window, position the cursor in the <BODY> section of the CSP source file. Delete the words My page body. Select Tools > Templates > Templates. Select Web Form Wizard from the list. Select the PhoneBook.Person class and select Next. Select the Name and PhoneNumber properties from the list of available properties. They should be displayed in the Selected Properties list. Save and compile the CSP file by selecting Build > Compile or Ctrl-F7 or the Compile icon . View the Web page in a browser by selecting View > Web Page or the Web Page icon . To learn more about using CSP to create Web pages, see the book Using Caché Server Pages (CSP). 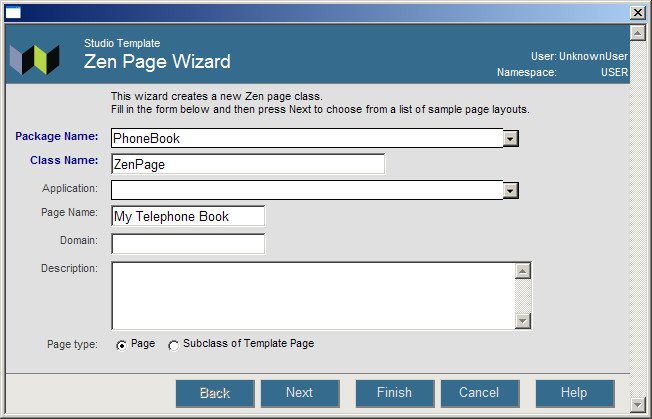 Zen supports several approaches to creating Web-based forms like the CSP form PhoneBook.Person in the previous section. The same set of technologies provides the foundation for both CSP and Zen. Zen makes the development of fully-featured Web applications faster while building on the client/server communication features that CSP provides. The CSP/Zen relationship is explained further in the book Using Zen. Display the Studio Inspector window by selecting View > Inspector. If not already showing, in the left column header, select Class from the drop-down list. An alphabetical list of class keywords displays. Find the Super keyword and select to highlight. The field currently holds the class name %Persistent and an ellipsis (...). Select the ellipsis. 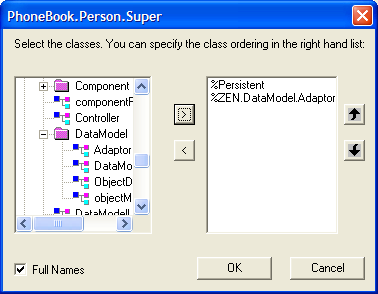 This opens a dialog in which you can choose superclasses in addition to %Persistent. In the left-hand column of the dialog, navigate to the %ZEN.DataModel.Adaptor class and select to highlight. At the center of the dialog, select >, the right-angle bracket to place the %ZEN.DataModel.Adaptor class into the right-hand column underneath %Persistent. Save and compile the PhoneBook.Person class. Choose File > New or Ctrl-N or the New icon . Select the Zen tab. Select New Zen Page. Select OK. Select Title Page for your initial page layout. Select Finish. Save and compile with Ctrl-F7. . In Studio, open the ZenPage class. After you type the character < Studio Assist displays a list of all elements. Typing <d brings you to the part of the list that includes <dataController> and <dynaForm>. Double-click on one of the choices to select it. Then type a space character and Studio Assist prompts you displays a list of attributes appropriate for that element. Continue in this manner until you have entered the entire line. Alternatively, if you are viewing this document online, you can cut and paste the <dataController> and <dynaForm> lines from the example above. Type the new elements or, if you are viewing this document online, you can cut and paste the <button> lines from the example. If you are curious about selecting the buttons New and Save, try it. An error message displays. Select OK to dismiss it. Position the cursor below the closing curly bracket of the XData Contents block, but before the closing curly bracket for the ZenPage class. Provide a Description as shown. /// Create a new instance of the controller object. Provide a Description of Create a new instance of the controller object. Select Finish. Your new method appears in the page class. /// Save the current instance of the controller object. Save and compile the class, then view the Web page. Select the New button on the page. The Name and PhoneNumber fields become empty so that you can enter new information for the next entry. After you have typed in each field, select the Save button. The new entry is saved in the database. Use New and Save repeatedly to add more entries. The <tablePane> sql attribute provides an SQL statement. SELECT lists the two properties from your PhoneBook.Person class, and FROM provides the full package and class name. This SQL query provides the data for the <tablePane>. Use New and Save to add more entries to the database. Select the browser refresh button to view the updated table. The new entries are visible. Use New and Save to add more entries to the database. Each time you select Save, the saveRecord method updates the table so that the newest entry becomes visible. To learn more about Zen, see the book Using Zen.